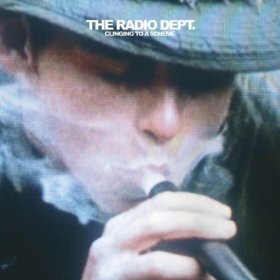 On The Radio Dept. website they offer a bunch of free downloads that are worth checking out. Clinging to a Scheme was definilty one of my top records in 2010. They offer the likes of 'Heaven's On Fire' through their website along with bootlegs from New York, Moscow, Sweden, and Peru concerts. Pretty generous of these guys and lots of great stuff. And if you haven't checked out Clinging to a Scheme just yet there is no better time. Labrador Records has this to say about Clinging.... "Clinging To A Scheme surfaced in spring 2010, on which the band has combined the most unequalled components from their previous output. Humbly and honestly, most reviewers were thrilled. First single Heaven’s On Fire is a passionate and yet passively aggressive attack on this unknown “you” in an almost cheerful song with a baggy hiphop-beat, obstinate guitars and a driving house-piano. Upcoming single Never Follow Suit has got Johan Duncanson’s hushed voice glued to a heavy bass, backbeat piano and shimmering flutes. A low-key but intense soliloquy on issues of belonging and not belonging."